Characteristics: Snakes may live on your property if there is ample food and suitable shelter. Size: Varies by species, but some snakes in TX can be as long as 7 feet. Snakes come in many different sizes, patterns and colors, some are poisonous and some are not. There are four common snakes in Texas that routinely find their way onto your property. Texas Rat Snake-This is a moderately sized snake that can grow past 6ft in length. They are mostly yellow to tan in color with olive-green to brown blotching on their body with a solid gray head. This is a non venomous species that feeds on birds, rodents, lizards and frogs. Western Cotton Mouth-This snake is also often referred to as a water moccasin, grows anywhere between 2-3 ft in length and has a flat broad head and an upturned nose. They range in color from buff to dark brown with darker cross bands across their backs; they have a thicker body that tapers off to a thinner tail. This is a venomous species of snake that can be found in almost all aquatic environments. Texas Corn Snake-This snake is another moderate sized snake and can range in size from 3-6 feet. Orange in color, Texas corn snakes have a black line around red colored markings going down their backs; their stomachs are checkered with white and black. They are a non venomous fairly docile snake that eats mostly small prey including rats and mice. Western Diamondback Rattlesnake– This snake has a very heavy body and can range in length from 3-7 ft. They have a distinct triangular shaped head and a dark diamond pattern running down its back. Their tail has black and white bands just above the rattle. This is a venomous snake that feeds of rats, mice, gophers and other small mammals. Why Do I Have A Snake Problem? People have snakes on their properties because they have a favorable living environment for the snakes and provide a food source. Snake species such as corn snakes are often found on farm properties or homes with large gardens because they feed on the small animals that are feeding on the crops. Other snakes such as the western cotton mouth are on your property because there is a pond, stream or marsh land. Snakes also like to find shelter in barns, garages, and may even enter homes through cracks in foundations. What Kind of Threats to Snakes Pose? Because some snakes in Texas are venomous they can pose a big danger to families and their pets. Being bitten by a poisonous snake can lead to serious health consequences and even death. 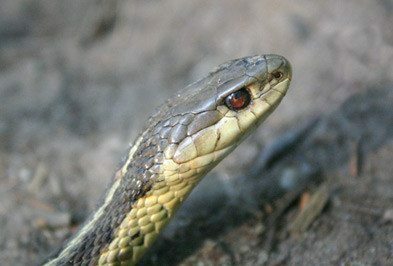 Medical attention should be sought immediately if a snake bite occurs. How Do I Control Snakes? If you have a snake problem on your property in Houston, your best course of action is to contact Holder’s Pest Solutions as soon as possible. The professionals at Holder’s will perform a full inspection of your property and correctly identify what species of snake is infesting it. After a careful assessment, our pest control technicians will safely and effectively remove them. We will also help to determine what on your property is attracting snakes to it and help to correct it. Contact us today to find out detailed information on how Holder’s Pest Solutions can help you get rid of snakes.